Call (678) 562-1068 for a FREE Quote! Trees should always remain an asset in your property. But if the time comes they get sick and have to be removed, contact us so our tree care professionals can check them. North Star Tree Service (NSTS) specializes in providing tree care services. We have Certified Arborists to evaluate your trees and share expert advice on how to care for them, better. As long as it’s about trees, there’s nothing we can’t handle for you. If you are from Suwanee GA and have tree concerns, contact us at (678) 562-1068.We’re more than happy to help. Trees are not created equal. They have unique needs. If you have different types of trees in your yard, it may be difficult to look after them. You need time, equipment, and expertise to ensure your trees stay in good condition for the years to come. You need to be extra prepared, too, should natural calamities hit your area. If you would love to instead spend your days off work for yourself and your loved ones, you can always partner with a trusted tree care company to inspect and maintain your trees. Here at North Star Tree Service, we provide high-quality services at an honest price. Our crew members are all experienced and professional. They will handle your tree project with care and also treat you and your home with respect. Rest assured, too, that all our men are working for us directly. We don’t hire subcontractors or day laborers. Most important, our company is fully insured and licensed. You can keep peace of mind knowing that we can cover for anything that might occur on the job site. We’ve already completed thousands of tree service projects across Metro Atlanta. We’d love to help you with yours, too. Why Should You Choose North Star Tree Service? Safety is a non-negotiable aspect of every job we deliver. NSTS is committed to following safety precautions in job sites, as well as adhering to local regulations. We come with the right gear and equipment. 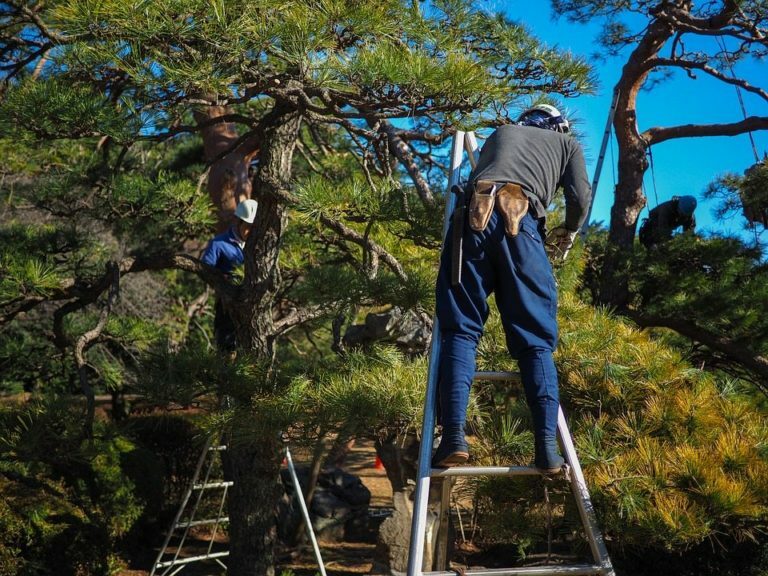 Our team is fully trained and experienced in handling even the most complex tree job. Trees need proper care to keep them in good condition. Properly-maintained trees are also less likely to acquire diseases or suffer from pest infestation. When your trees are healthy, they help your property increase in value. North Star Tree Service provides honest rates. You can talk to us to discuss the cost of your tree project. We want you to know where your investment goes. Our crew members respond promptly to client calls.Delaying action may lead to more inconveniences, especially during emergencies. We get the job done as quickly as possible. If it’s your first time to submit claims for tree-related damages, we can help. We have estimators that can assist you as you work on your claims or coordinate with your insurance provider. Sick or dying trees may still be saved. Our Certified Arborist can examine your trees and determine the best intervention method to use. For increased efficiency, we use the latest technology in our tree care projects. Trees should be checked regularly to keep them in good condition. Routine maintenance protects your trees from complex issues. You also prevent spending more as we commit to doing the job right, the first time. If you need your trees secured or removed to give way to a building project, contact us. We have all necessary equipment and our team members are trained to handle both small and large-scale projects. Why Partner With North Star Tree Service? Enjoy Peace of Mind Working With a 5-Star Rated, ISA Certified Tree Company. Downed trees will have to be handled with caution. Be sure to hire a licensed, professional tree service provider for the job. North Star Tree Service provides tree care services following a storm or natural disaster. Although tree removal is a common job, it can’t be carried out by random workers. This project requires expertise, skill, and common sense, which novice workers may lack. NSTS only employs qualified and professional technicians on our team so customers can also receive quality services. Tree trimming may sound simple, but in performing this job, knowledge of related local regulations and laws are necessary. A professional tree care company, such as NSTS, is well-versed not only on local policies covering tree projects but also on proper trimming techniques that every type of tree requires. Freeing your yard from tree debris can take more than a day. Leave the job to professionals so you can focus on other activities. We can help keep your trees and yard looking great at an affordable price. We can work with your contractor or developer every step of the way to ensure that your trees are safe or are removed properly. We can also educate everyone in the project site on safety precautions when working around trees. Preserve your trees so your next generations can as well enjoy their presence. Consult our Certified Arborist on the best way to keep your trees healthy. We'll help you pick the right trees to install and maintain in your yard. Talk to us about your requirements and we'll recommend appropriate choices. If it’s mulch that you need, call us. We may be able to deliver free mulch right at your doorstep. North Star Tree Service also performs other jobs, such as hardscaping. Let us know which other services you need and we may be able to get them done for you, too. Got any tree-related question or project in mind? Does this tree need to be removed? Is tree removal the best option? How much budget do I need for a full tree removal? What should I do with my sick trees? How can I keep our trees safe from diseases? Can my trees still recover following an infestation? If it’s about trees, leave it to us. North Star Tree Service handles both residential and commercial projects. Request a free quote today for your tree project. Or schedule a site visit in Suwanee GA. Get in touch with tree care experts at (678) 562-1068. Where do We Offer Tree Services?